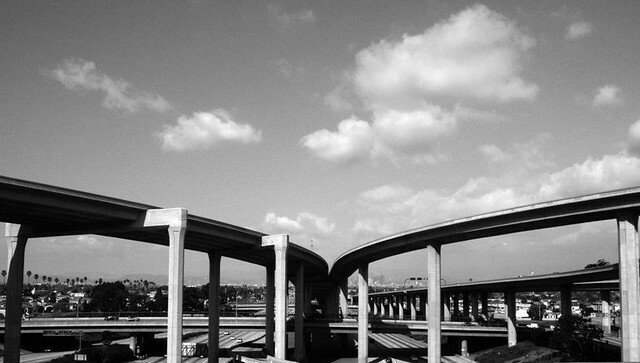 These two photos depict the Judge Harry Pregerson Interchange, a “stack” freeway interchange that joins the 105 and the 110 freeways in South Los Angeles. I was struck by the complex engineering solutions and sheer magnitude of the interchange — one of the biggest and tallest infrastructure projects built by the California Department of Transportation that integrates individual cars, high-occupancy vehicles, and light-rail trains. I took these photos during my second visit to the city in early 2012, when I learned how to appreciate L.A. beyond its many stereotypes. It is no surprise that images like these have become synonymous with L.A.’s unique urbanism, a city whose icon was never a building, park, monument, the skyline, or a specific dish, but rather a sign, pier, car, or an endless concrete surface. 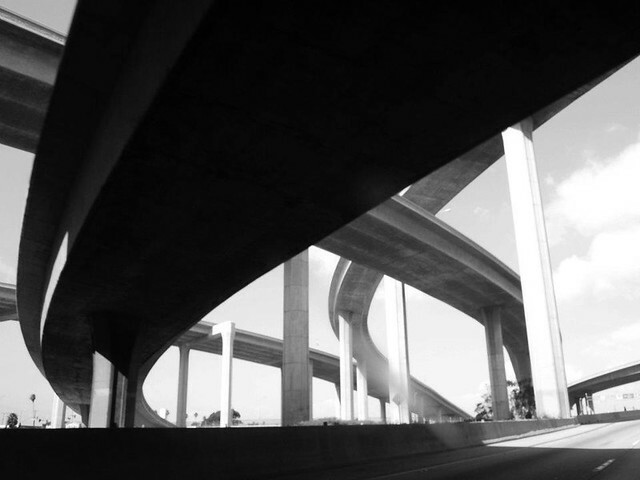 In many ways L.A.’s beauty relies on particular aesthetics of overlapping infrastructure and landscapes — the freeways, oil fields, rail yards, and the L.A. River — where confines between the natural and built environment fade out. Jerolim Mladinov is an architect from Croatia who worked as architect and teacher in Croatia, Columbia, Spain, and USA, and is a founding member of Pulska Grupa. I love this! I think Jere really captured that the beauty of my native Los Angeles is often hidden under many varied layers (from history to concrete infrastructure). Best of all, it’s always wonderful to see how a visitor’s image of Los Angeles changes over time — for the better! Thanks Linda for having the “fresh eye” to find these photos. I really liked the captures, Though its hidden, some one there to view from their eyes and show to this world the beauty as it is . Los Angeles at its best simply i can say .Thanks to the photographer and the blog writer. This is a freeway in Los Angeles ?